It is Halloween. 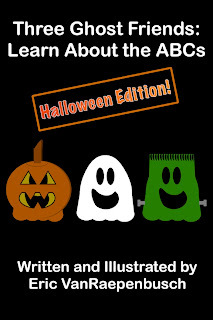 Three Ghost Friends hope finding costumes that match will be as easy as ABC. But, will they agree on costumes before they get to XYZ? Check out over 40 activity ideas and free printable activities on the activities page! The free activities are designed to extend the Three Ghost Friends experience beyond the iPad and iPhone! This book is for children ages 2 - 7. Teaches the alphabet and categorization. This images shows many thumbnail images of the book. The ghosts try to find matching costumes but it proves to be difficult. One ghost always has another idea. A mummy? That's not a water animal! Silly ghost! Don't you just love that pumpkin? But, it is not a medieval character! There is just over 100 days until Halloween! Get your copy today!